1Department of Ophthalmology, Faculty of Medicine, Chiang Mai University, Chiang Mai, Thailand. 2Division of Hematology, Department of Medicine, Faculty of Medicine, Chiang Mai University, Chiang Mai, Thailand. 3Department of Ophthalmology, Faculty of Medicine, King Chulalongkorn Memorial Hospital, Bangkok, Thailand. 4Division of Hematology, Department of Medicine, Faculty of Medicine, King Chulalongkorn Memorial Hospital, Bangkok, Thailand. Received: August 2, 2018; Revised: August 13, 2018; Accepted: August 27, 2018; Published online: December 17, 2018. Primary ocular adnexal extranodal marginal zone lymphoma of mucosa-associated lymphoid tissue (POML) is the most common subtype of lymphoma involving the eyes in Thailand. We sought to assess the characteristics and treatment outcomes of patients with POML in Thailand. We retrospectively reviewed patient data and included patients diagnosed with POML between January 2004 and December 2016 at Chiang Mai University Hospital and King Chulalongkorn Memorial Hospital, Thailand. We collected and analyzed patients' clinical characteristics and treatment outcomes. Among 146 patients with lymphoma involving the eyes, 121 (82%) were diagnosed with POML. Sixty-four (52.9%) were women with median age 58 (range, 22–86) years. The most common presenting symptom was orbital mass (71.1%). Common sites of origin were the orbit (46.3%) and lacrimal gland (34.7%). At presentation, 22.3% of patients had bilateral eye involvement. About half of patients had stage I disease (N=59, 56.2%) and 20% had stage IV. Most patients (73.3%) had a low-risk International Prognostic Index. Radiotherapy was the main treatment for patients with limited-stage disease (66.7% in stage I and 56.5% in stage II). The overall response rate was 100% with complete response rates 80%, 77.3%, and 64.7% for stages I, II, and IV, respectively. Five-year progression-free survival (PFS) and overall survival were 66.1% and 94.0%, respectively. For patients with limited-stage disease, radiotherapy significantly improved PFS compared with treatment not involving radiotherapy (5-year PFS 89.9% vs. 37.3%, P=0.01). We revealed that POML has good response to treatment, especially radiotherapy, with excellent long-term outcome. Primary ocular adnexal lymphoma, defined as lymphoma that occurs in the conjunctiva, lacrimal apparatus, eyelid, or orbit, is the most common malignancy of the eye . This disease comprises 55% of orbital tumors and 8% of extranodal lymphomas ; the most frequent subtype is extranodal marginal zone lymphoma of mucosa-associated lymphoid tissue (MALT). MALT lymphoma, which originates in B-cells, represents approximately 75% of primary ocular adnexal lymphomas . Common sites of primary ocular adnexal MALT lymphoma (POML) are the orbit, conjunctiva, and lacrimal apparatus. POML usually affects elderly patients , with bilateral disease found in 15.6% of those affected . Most patients (79.6%) with POML are diagnosed with Ann Arbor Stage I, which is commonly treated using involved-field radiotherapy and responds very well to radiotherapy . Currently, only a limited number of studies, mostly from Western countries, have reported the clinical characteristics and treatment outcomes of patients with POML. To improve the diagnosis and quality of treatment in patients with POML, we conducted a large retrospective multicenter study to elucidate the characteristics and treatment outcomes of patients with POML in Thailand. We reviewed patients' medical records and operative notes between January 2004 and December 2016 (13-year period) at Chiang Mai University Hospital and King Chulalongkorn Memorial Hospital in Thailand, to identify and recruit patients with POML for this study. We included patients diagnosed with POML between January 2004 and December 2016 who had a follow-up period of at least 1 year. Patients with large-cell transformation were excluded. All pathological results were reported according to the World Health Organization (WHO) classification of tumors of hematopoietic and lymphoid tissues. Hematopathologists reviewed and confirmed all diagnoses of POML, according to the 2008 WHO classification of lymphoid neoplasms, using evidence of dense infiltration of mucosal and submucosal tissues by small lymphocytes that were CD20 positive, CD5 negative, CD10 negative, or showing light-chain restriction. Cyclin D1 was performed only for B-cell neoplasms with CD5 coexpression. This study was approved by the Institutional Review Board of Chiang Mai University Hospital and King Chulalongkorn Memorial Hospital, Thailand. We collected patients' demographic data, including age at diagnosis, gender and underlying diseases. Clinical data included clinical presentation, time to diagnosis, tissue biopsy procedure, anatomical location, laterality, lymphoma subtype, immunophenotype, Ann Arbor staging, number of extranodal sites, and Eastern Cooperative Oncology Group (ECOG) performance status. According to Ann Arbor staging, patients were classified as stage IE with lymphoma involving a single eye and stage IIE with lesions involving both eyes, as determined by clinical examination and imaging studies, or involving regional lymph nodes on the same side of the diaphragm. Patients were classified as stage IV when there was additional noncontiguous or disseminated involvement of other extralymphatic organs. Additional data included serum lactate dehydrogenase (LDH) levels, serologic testing for human immunodeficiency virus (HIV) and for hepatitis B virus (HBV) and hepatitis C virus (HCV), International Prognostic Index (IPI), treatment modalities including type of chemotherapy and radiotherapy, response to treatment, disease status, salvage therapy, and current status of the patient. All treatment outcomes were evaluated at the end of treatment and disease status was evaluated at the time of last follow-up. Demographic and response rates were analyzed using descriptive statistics. Overall survival (OS) was measured from the date of diagnosis to the date of last follow-up or death from any cause. Progression-free survival (PFS) was calculated from the date of diagnosis to the date of last follow-up, relapse/progression, or death from any cause. Probabilities of OS and PFS were estimated using the Kaplan-Meier method and the log-rank test for survival comparison. All statistical analyses were performed with SPSS 16.0 for Windows (SPSS Inc., Chicago, IL, USA). Between January 2004 and December 2016, among 146 patients with ocular lymphoma, 121 (82%) patients were diagnosed with POML. Demographic and clinical characteristics of patients with POML are summarized in Table 1. Sixty-four patients were women (52.9%) with a median age at diagnosis of 58 years (range, 22–86 yr). Common presenting symptoms were orbital mass (71.1%), proptosis (25.6%), eye pain (2.5%), and cellulitis (0.8%). The median interval between onset of the first symptoms and the date of diagnosis was 6 months (range, 1–84 mo). The anatomical distribution was as follows: orbit (46.3%), lacrimal apparatus (34.7%), conjunctiva (9.9%), and eyelid (8.3%). Twenty-seven patients presented with bilateral eye involvement (22.3%). Most patients had disease stage IE (N=59, 56.2%), and 23.8% and 20% of patients had stage IIE and IV disease, respectively. Among patients with stage IV, the most common site of involvement was the lacrimal gland (61.9%). Of these, almost 20% of patients had more than one extranodal site of origin. Most patients (N=115, 96.6%) had ECOG performance status of 0, including those with stage IV disease. Most patients also had normal serum LDH levels (91.4%) and low-risk IPI (73.3%). There was only one patient (1.1%) with HIV infection and 6 and 3 patients tested positive for HBV (6.7%) and HCV (3.3%) infection, respectively. Of 105 patients with known staging status, 92 required treatment (Table 2). 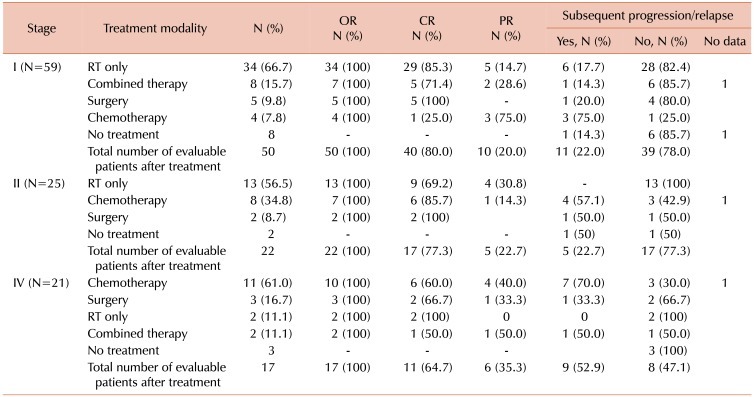 Radiotherapy was the mainstay of treatment for patients with limited-stage disease (66.7% in stage I and 56.5% in stage II) whereas chemotherapy alone (61.1%) was the most common treatment modality for patients with stage IV. Although all patients required surgical biopsy, surgery for tumor removal was infrequently performed (stage IE: 9.8%, stage IIE: 8.7%, and stage IV: 16.75%). Commonly selected chemotherapy regimens were CVP (cyclophosphamide, vincristine, and prednisolone; 53.1%), CP (chlorambucil and prednisolone; 28.1%), rituximab-CVP (12.5%), and CHOP (cyclophosphamide, doxorubicin, vincristine, and prednisolone; 6.2%). The overall response rate for evaluable patients was 100%. The complete response (CR) rate was 80%, 77.3%, and 64.7% in patients with stage IE, IIE, and IV, respectively. During follow-up, of 89 patients who were evaluable after treatment, 25 had relapsed or had disease progression (28%). For those who did not require treatment at diagnosis (N=13), 20% (N=2) of patients with stage IE-IIE (N=10) had subsequent disease progression and required further therapy; no patients with stage IV disease (N=3) had progressed at the time of last follow-up. At a median follow-up of 44 months (range, 3–159 mo), 30 patients had relapsed, and 4 patients had died. No patients died from lymphoma or treatment-related causes. The 5-year PFS and OS were 66.1% and 94.0%, respectively. (Fig. 1A, B). The Kaplan-Meier survival curve of PFS plateaued after 5 years as no late relapse occurred. Patients with limited-stage disease had a trend of better PFS and OS than those in advanced stages, with a 5-year PFS of 77.4% and 52.5% for patients with limited- and advanced-stage disease, respectively (P=0.063) (Fig. 2A); the corresponding figures for 5-year OS were 96.0% and 81.7%, respectively (P=0.123) (Fig. 2B). In patients with limited-stage disease (stages I and II), radiotherapy significantly improved PFS, in comparison with treatment that did not include radiotherapy (5-yr PFS 89.9% vs. 37.3%, P=0.01) (Fig. 3A); additional radiotherapy had no significant effect on PFS in patients with advanced stage disease (5-yr PFS 66.7% vs. 37.4% for radiotherapy vs. non-radiotherapy based regimens, P=0.36) (Fig. 3B). Nevertheless, treatment modalities had no impact on overall survival in both limited (P=0.22) and advanced stages of disease (P=0.48). IPI, as well as other baseline characteristics, did not significantly affect PFS and OS in univariate analysis. In the multivariable analysis, radiotherapy-containing regimen was the only factor independently associated with a better PFS [hazard ratio (HR) 0.25 (95% CI, 0.09–0.67), P=0.006] in patients with limited-stage disease, but it did not significantly improve PFS [HR 0.47 (95% CI, 0.05–0.37), P=0.47] in those with advanced stages of disease. POML is the most common subtype of ocular adnexal lymphoma in Thailand (82%). Currently, there are a limited number of reports regarding POML; these are mostly from studies conducted in Western countries  with a few from Asia . The median patient age at diagnosis in our study was younger (53 yr) than those in Western studies  but the same as those in Asian cohorts  (Table 3). Because of the indolent nature of this subtype of lymphoma, the median interval between onset of the first symptoms and time of diagnosis is quite long (median, 6 mo). The most common site of origin in our patients was the orbit, similar to most studies. ; however, some studies reported that the conjunctiva was the most common site of origin  Interestingly, only 10% of patients in our cohort had conjunctival POML. This may be partly explained by characterization of pink conjunctival patches in POML as benign lesions, which may not require medical attention or surgical biopsy. Nearly one-fourth of patients presented with bilateral disease. Desai et al. suggested that bilateral involvement was associated with inferior outcome. However, we could not demonstrate an adverse outcome in patients with bilateral disease, particularly those with stage II disease. 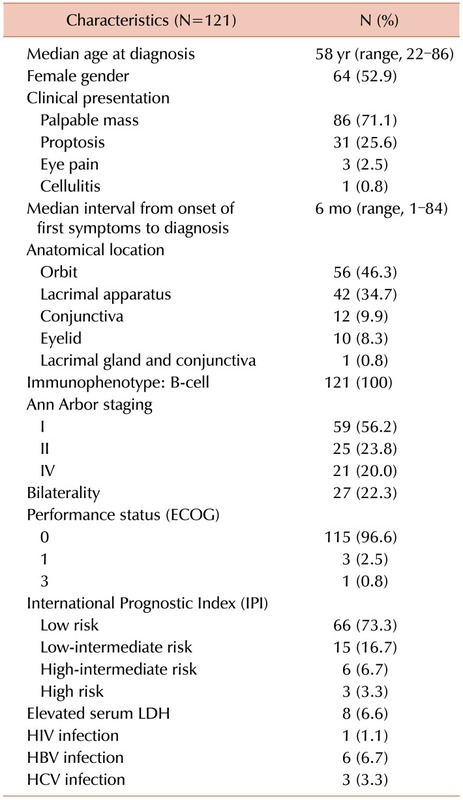 Most of our patients had Ann Arbor stage I at diagnosis, with low-risk IPI, correlating well with all previous reports . Viral serology, including HIV, HBV, and HCV, showed no clear association with POML in this cohort. A strong correlation has been demonstrated between Chlamydia psittaci infection and ocular adnexal lymphoma ; however, we did not perform testing to detect C. psittaci in this cohort owing to limited resources. All patients in our cohort responded to treatment (overall response 100%) with a CR rate of 80.0% and 77.3% in patients with stage I and II, respectively. Radiotherapy was the most common first-line treatment for patients with limited-stage POML and showed excellent local disease control; these findings are concordant with the results of other studies  (Table 3). Although radiotherapy significantly improved PFS in patients with limited-stage disease, as compared with omitting radiation (5-yr PFS 80.3% vs. 48.2%, P=0.013), combined chemoradiotherapy did not show significant improvement in PFS over chemotherapy alone in patients with advanced stages (P=0.36); this is owing to the fact that chemotherapy alone has sufficient efficacy to control systemic involvement in POML. Thus, in patients with advanced disease, additional radiotherapy should be considered only for those who do not achieve CR after chemotherapy. Our report helps to confirm that radiotherapy is the appropriate standard treatment for patients with limited-stage POML but has no obvious additional benefit for patients in advanced stages of the disease. For advanced-stage POML, chemotherapy was the most common treatment option in our cohort; however, there was a high relapse rate of 70%. This can be explained by the incurable nature of advanced-stage indolent lymphoma, as chemotherapy cannot eradicate tumor cells in resting phase. This study included one of the largest cohorts of patients with POML in Asia. We demonstrated a good long-term survival outcome with 5-year PFS and OS of 66.1% and 94.0%, respectively. We found that the IPI, which was developed using a cohort of patients with aggressive lymphoma, especially diffuse large B-cell lymphoma, was not helpful to predict survival in patients with POML. Unfortunately, we could not identify any baseline characteristics, including the anatomical site of involvement, which significantly affected survival in patients with POML. However, advanced stage disease at diagnosis tended to predict poorer PFS than limited-stage disease (5-yr PFS of 77.4% vs. 52.5%, P=0.063), perhaps owing to the relatively small number of patients with advanced disease (N=21) in this cohort. Some studies  have reported that age over 60 years, Ann Arbor staging, nodal involvement, and elevated serum LDH are poor prognostic indicators. Although the present research achieved our aims, there were some unavoidable limitations. First, there was a limitation in the data collection due to the retrospective nature of this study. Second, we did not collect information on radiation dose or complications after treatment. Third, we did not test for C. psittaci infection in tissue samples. Finally, this cohort included a relatively small number of patients, which may limit the analysis of prognostic factors affecting the outcome. Therefore, we plan to conduct a prospective multicenter study in Thailand with a larger population of patients and utilizing high-quality data collection. In conclusion, we found that POML had a good response to treatment and excellent long-term outcome. Radiotherapy has a primary role in local disease control for patients with limited-stage POML, contributing to an improvement in long-term outcome for this group of patients. Kaplan-Meier curve of progression-free survival (PFS) in patients with primary ocular adnexal MALT lymphoma (A) and primary ocular adnexal MALT lymphoma (B). Kaplan-Meier curve of progression-free survival (PFS) in patients with primary ocular adnexal MALT lymphoma, according to Ann Arbor stage. (A) Five-year PFS 77.4% versus 52.5% for patients with limited- versus advanced-stage disease (P=0.063). (B) Five-year OS 96.0% versus 81.7% for patients with limited- versus advanced-stage disease (P=0.123). (A) Kaplan-Meier progression-free survival (PFS) between radiotherapy and non-radiotherapy-based treatment in patients with limited-stage primary ocular adnexal MALT lymphoma. Five-year PFS 89.9% and 52.9%, respectively (P=0.007). (B) Kaplan-Meier progression-free survival (PFS) comparison between radiotherapy-containing therapy and non-radiotherapy-containing therapy in patients with advanced-stage primary ocular adnexal MALT lymphoma. Five-year PFS 66.7% and 49.5%, respectively (P=0.52). Demographic and clinical characteristics of primary POML. Abbreviations: ECOG, Eastern Cooperative Oncology Group; HBV, hepatitis B virus; HCV, hepatitis C virus; HIV, human immunodeficiency virus; LDH, lactate dehydrogenase; POML, primary ocular adnexal extranodal marginal zone lymphoma of mucosa-associated lymphoid tissue. Treatment modalities, response rates, and relapse, according to staging. Abbreviations: CR, complete response; OR, odds ratio; PR, progression; RT, radiotherapy. Selected large cohort studies investigating POML. Abbreviations: CT, chemotherapy; EFS, event-free survival; N, number of cases; NA, not applicable; OS, overall survival; PFS, progression-free survival; POML, primary ocular adnexal extranodal marginal zone lymphoma of mucosa-associated lymphoid tissue lymphoma; RT, radiotherapy. Margo CE, Mulla ZD. Malignant tumors of the orbit. Analysis of the Florida Cancer Registry. Ophthalmology 1998;105:185-190. Freeman C, Berg JW, Cutler SJ. Occurrence and prognosis of extranodal lymphomas. Cancer 1972;29:252-260. White WL, Ferry JA, Harris NL, Grove AS. Ocular adnexal lymphoma. A clinicopathologic study with identification of lymphomas of mucosa-associated lymphoid tissue type. Ophthalmology 1995;102:1994-2006. McKelvie PA, McNab A, Francis IC, Fox R, O'Day J. Ocular adnexal lymphoproliferative disease: a series of 73 cases. Clin Exp Ophthalmol 2001;29:387-393. Yen MT, Bilyk JR, Wladis EJ, Bradley EA, Mawn LA. Treatments for ocular adnexal lymphoma: a report by the american academy of ophthalmology. Ophthalmology 2018;125:127-136. Ferreri AJ, Dolcetti R, Du MQ, et al. Ocular adnexal MALT lymphoma: an intriguing model for antigen-driven lymphomagenesis and microbial-targeted therapy. Ann Oncol 2008;19:835-846. Desai A, Joag MG, Lekakis L, et al. Long-term course of patients with primary ocular adnexal MALT lymphoma: a large single-institution cohort study. Blood 2017;129:324-332. Bayraktar S, Bayraktar UD, Stefanovic A, Lossos IS. Primary ocular adnexal mucosa-associated lymphoid tissue lymphoma (MALT): single institution experience in a large cohort of patients. Br J Haematol 2011;152:72-80. Graue GF, Finger PT, Maher E, et al. Ocular adnexal lymphoma staging and treatment: American Joint Committee on Cancer versus Ann Arbor. Eur J Ophthalmol 2013;23:344-355. Smiljanic M, Milosevic R, Antic D, et al. Orbital and ocular adnexal Mucosa-Associated Lymphoid Tissue (MALT) lymphomas: a single-center 10-year experience. Med Oncol 2013;30:722. Portell CA, Aronow ME, Rybicki LA, Macklis R, Singh AD, Sweetenham JW. Clinical characteristics of 95 patients with ocular adnexal and uveal lymphoma: treatment outcomes in extranodal marginal zone subtype. Clin Lymphoma Myeloma Leuk 2014;14:203-210. Ferreri AJ, Govi S, Pasini E, et al. Chlamydophila psittaci eradication with doxycycline as first-line targeted therapy for ocular adnexae lymphoma: final results of an international phase II trial. J Clin Oncol 2012;30:2988-2994. Uno T, Isobe K, Shikama N, et al. Radiotherapy for extranodal, marginal zone, B-cell lymphoma of mucosa-associated lymphoid tissue originating in the ocular adnexa: a multiinstitutional, retrospective review of 50 patients. Cancer 2003;98:865-871. Tanimoto K, Kaneko A, Suzuki S, et al. Primary ocular adnexal MALT lymphoma: a long-term follow-up study of 114 patients. Jpn J Clin Oncol 2007;37:337-344. Han JJ, Kim TM, Jeon YK, et al. Long-term outcomes of first-line treatment with doxycycline in patients with previously untreated ocular adnexal marginal zone B cell lymphoma. Ann Hematol 2015;94:575-581. Harada K, Murakami N, Kitaguchi M, et al. Localized ocular adnexal mucosa-associated lymphoid tissue lymphoma treated with radiation therapy: a long-term outcome in 86 patients with 104 treated eyes. Int J Radiat Oncol Biol Phys 2014;88:650-654. Lee JL, Kim MK, Lee KH, et al. Extranodal marginal zone B-cell lymphomas of mucosa-associated lymphoid tissue-type of the orbit and ocular adnexa. Ann Hematol 2005;84:13-18. Son SH, Choi BO, Kim GW, et al. Primary radiation therapy in patients with localized orbital marginal zone B-cell lymphoma of mucosa-associated lymphoid tissue (MALT Lymphoma). Int J Radiat Oncol Biol Phys 2010;77:86-91. Fung CY, Tarbell NJ, Lucarelli MJ, et al. Ocular adnexal lymphoma: clinical behavior of distinct World Health Organization classification subtypes. Int J Radiat Oncol Biol Phys 2003;57:1382-1391. Cahill M, Barnes C, Moriarty P, Daly P, Kennedy S. Ocular adnexal lymphoma-comparison of MALT lymphoma with other histological types. Br J Ophthalmol 1999;83:742-747. Wenzel C, Fiebiger W, Dieckmann K, Formanek M, Chott A, Raderer M. Extranodal marginal zone B-cell lymphoma of mucosa-associated lymphoid tissue of the head and neck area: high rate of disease recurrence following local therapy. Cancer 2003;97:2236-2241. Ferreri AJ, Guidoboni M, Ponzoni M, et al. Evidence for an association between Chlamydia psittaci and ocular adnexal lymphomas. J Natl Cancer Inst 2004;96:586-594. Nam H, Ahn YC, Kim YD, Ko Y, Kim WS. Prognostic significance of anatomic subsites: results of radiation therapy for 66 patients with localized orbital marginal zone B cell lymphoma. Radiother Oncol 2009;90:236-241. Hata M, Omura M, Koike I, et al. Treatment effects and sequelae of radiation therapy for orbital mucosa-associated lymphoid tissue lymphoma. Int J Radiat Oncol Biol Phys 2011;81:1387-1393. Coupland SE, Hellmich M, Auw-Haedrich C, Lee WR, Anagnostopoulos I, Stein H. Plasmacellular differentiation in extranodal marginal zone B cell lymphomas of the ocular adnexa: an analysis of the neoplastic plasma cell phenotype and its prognostic significance in 136 cases. Br J Ophthalmol 2005;89:352-359. Cho EY, Han JJ, Ree HJ, et al. Clinicopathologic analysis of ocular adnexal lymphomas: extranodal marginal zone b-cell lymphoma constitutes the vast majority of ocular lymphomas among Koreans and affects younger patients. Am J Hematol 2003;73:87-96. Auw-Haedrich C, Coupland SE, Kapp A, Schmitt-Gräff A, Buchen R, Witschel H. Long term outcome of ocular adnexal lymphoma subtyped according to the REAL classification. Revised European and American lymphoma. Br J Ophthalmol 2001;85:63-69. Jenkins C, Rose GE, Bunce C, et al. Histological features of ocular adnexal lymphoma (REAL classification) and their association with patient morbidity and survival. Br J Ophthalmol 2000;84:907-913.